A skeletal muscle biologist, Dr. Maisha has been conferred the degree of Doctor of Philosophy (PhD) in Science from the School of Biological Sciences at Nanyang Technological University (NTU), Singapore, 2017 (WES Accredited). She is currently a Research Fellow at NTU and a Research Associate at Karolinska Institutet (KI). She is a Global Shaper in the Global Shapers Community (Singapore Hub), which is an initiative of the World Economic Forum (WEF). More recently, she has been selected as an ASEAN Youth Fellow, 2018, a network of next generation leaders, who will influence and inspire youth to take the ASEAN community forward as a strong and unified entity. Dr. Maisha has been installed as the Chairperson of the Commonwealth Students’ Association (CSA) at the 20th Conference of the Commonwealth Education Ministers (CCEM) in Fiji, 2018. The new team has been officially inaugurated by the Secretary General of the Commonwealth, the Rt. Hon. Patricia Scotland. Recently appointed as a Board of Director of Global Peace Chain, she also works with young people on a journey towards peace and sustainable development. She has been invited to speak on various panels including the 20th CCEM, Commonwealth Youth Forum (CYF), 2018 and the NUS STEP Ecosperity Young Leaders Dialogue. In the capacity of Chair of the CSA she has been interviewed by BBC News and BBC World News and spoke as a Guest-of-Honour at the 1st India-Bangladesh Commonwealth Youth Conclave (IBCYC). She serves on the Youth Advisory Council of the Youth Skills and Innovation Initiative (YSII), launched at the United Nations General Assembly (2017) by the Global Business Coalition for Education (GBC-Ed) and Intel Corporation (Intel) with a mission to enhance the skills and innovation readiness of young people and equip them with the tools to operate in a future workforce. A Finalist for The Queen’s Young Leader Award (2018), Dr. Maisha is an Associate Fellow of The Royal Commonwealth Society (RCS) and a member of the Commonwealth Youth Gender Equality Network (CYGEN). In recognition for her leadership in women’s empowerment and advocacy for education she has been featured on several magazines and podcasts; The Asian Entrepreneur Magazine, the world’s first and leading business magazine that facilitates the Asian startup scene, Youth Initiative Magazine (YIMagazine), supported by UNODC, as part of their Young and Ambitious campaign, in Sarah Brown’s Better Angels Podcast: New Year Special (Better Angels with Sarah Brown), a podcast, which celebrates the activist spirit and Digging Deep, Best People, Best Conversations with Touhid Kamal. Her advocacy for children’s education led to her appointment as a Global Youth Ambassador (GYA) for Education at A World at School (AWAS), Theirworld. She has represented Theirworld as a Youth Leader at the Commonwealth Youth Summit 2017. She was awarded GYA of the Month (Dec 2017) and has been designated a GYA Influencer. Having a strong passion for women’s leadership and gender equality, she was selected as a Leader of Tomorrow at the eminent 46th St. Gallen Symposium, advocating for equal opportunities and resources for women. Her pilot project, Leading Ladies in their Queendom shares micro-narratives of outstanding young women, which highlight some of the obstacles to their empowerment. This interview series has been featured as a Change Maker project on We Can! Singapore, a campaign to end all violence against women. She is also an Author on YMAZING: Generation Y – Generation Z – Millennials. 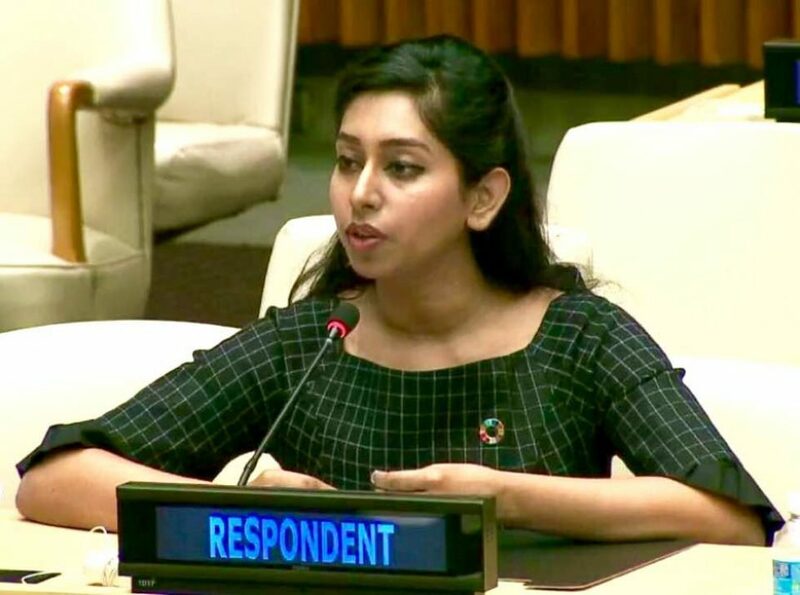 Dr. Maisha was invited by the 71st President of the UN General Assembly, His Excellency, Peter Thomson to speak as a Youth Respondent for the High-Level Sustainable Development Goals Action Event on Education at the United Nations headquarters in New York. She formulated recommendations on ‘Education for sustainable development and education for global citizenship’ and has been pinned as a Global Sustainable Development Goals Champion by Special Adviser, Her Excellency, Ambassador Dessima Williams. Her global citizenship education in Singapore has inspired her to use her privilege as a platform to encourage education and equity in underprivileged environments.